How does a 'skills accelerator' like The Branch work? A ‘skills accelerator’ gives high-potential college students the training, connections and experience needed to develop the skills necessary for the careers of tomorrow. The Branch will teach collaboration, communication, creativity and critical thinking through entrepreneurial and corporate innovation projects. Students with a desire to build a startup or to someday innovate for a corporation will be drawn to The Branch. Participants will experience hands-on, real-world professional development and will learn how to collaborate, communicate, and think critically and creatively. The brightest minds from across the region will be involved. Participating businesses will gain access to this new talent pipeline. Businesses will also have the opportunity to change the perception these students may have about your corporate culture. The Branch will offer professional development opportunity to young leaders and middle managers through their participation as mentors. What types of projects are the best fit for The Branch? Corporate innovation projects put forth by sponsor businesses will include those with a focus on, but not limited to, marketing, information technology and manufacturing. The Branch will assemble students into groups to best achieve the project's goals. How is The Branch different from an internship? Students will have a higher level of engagement with a focus on problem solving, collaboration and creativity. Businesses may find that The Branch is an ideal method for vetting potential interns. 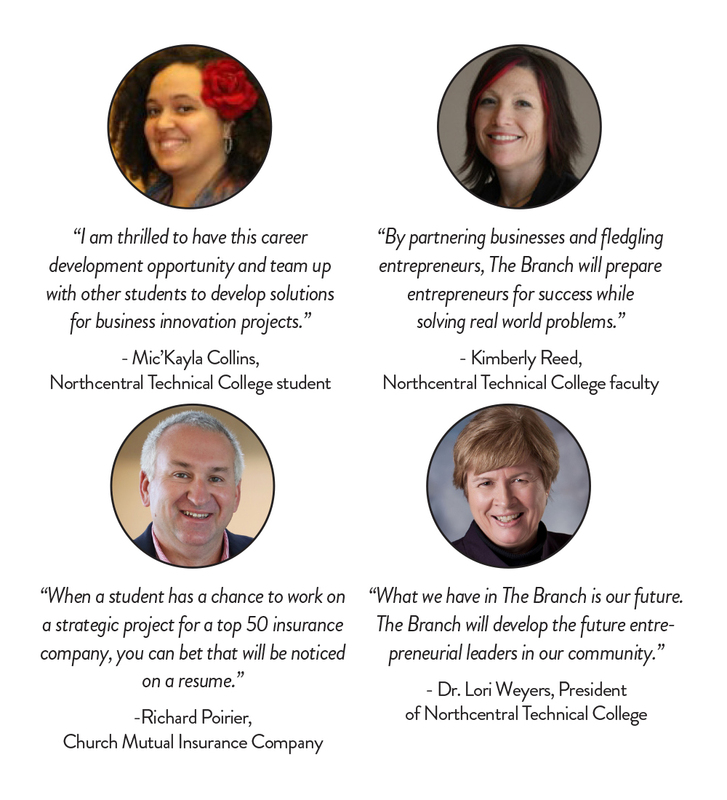 The Branch is looking for additional sponsors, innovative projects and mentors. For more information, contact Brian Otten at the Wausau Region Chamber of Commerce. Business participation in The Branch is limited to members of the Wausau Region Chamber of Commerce. The Branch will produce qualified candidates to feed the workforce pipeline. The Branch will recruit, develop and retain talent to central Wisconsin. The Branch will define an entrepreneurial culture for central Wisconsin.